Kathakali: This dance form originated from Kerala. Kathakali includes a mythological story being depicted through intense foot and hand movements and face expressions. Kathakali is a mixture of five forms of art they are Sahithyam(literature), Sangeetham (music) Natyam is acting, Nrthriyam is dance and Chitram is painting. Kathakali had major influence from Krishnattam, Ramanattam, Koodiyattam and Chakiarkootu. Among the four the major were krishnattam and Ramanattam. In this Krishnattam is the dance drama form about Lord Krishna and Ramanattam was based on Lord Rama and Ramayana. Kathakali has various martial arts steps included. Traditionally this dance was based on mythological stories of Ramayana, Mahabharata and about Lord Krishna but now in modern times it has included various other factors as well. Previously the character of women was done by male dancers himself but now women are included in this dance form. Compared to other classical dances Kathakali has a different costume. Kathakali has its roots in the ancient text called as Natya Shastra. It is a Sanskrit text on performing arts written by Baratha Muni. it consists of 6000 verses and over 36 chapters. The emotions and feelings in the dance are expressed through eyes and facial movements. Kathaklai has various mudras through which the dancers speak with the auidence. There are more than 500 plays written for kathakali . Some plays are interconnected. 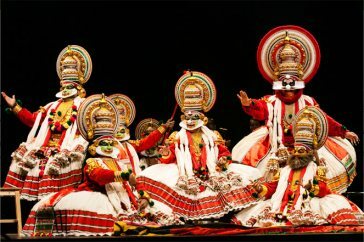 Some of the famous artists of kathakali are Kalamandalam Gopi, Kalamandalam Ramkutty Nair, Kottakal Sivaraman, Kalamandalam Kesavan Namboodiri and many more…. Costume—Costume plays a vital role in kathakali. It depicts the character of the performing artist. Different colours are painted . each colour represents different charcter. The face is painted heavily with bright colours and with a huge head throne. The colours used on face are all natural colour made of rice flour and other natural ingredients. The eyebrows are painted with black paint. The makeup done is of seven types—Pacha (green), Kathi (knife), Thadi (beard), Kari (black), Pazhuppu (silver), Teppu (white) and Minnuku (orange). Usually vegetable colours are used to paint faces. Each colour painted on each face indicate different characters. The person who has painted green on face with red lipsticks portrays the character of Lord Krishna, Vishnu, Rama and Yudhistra. If red is painted it shows the character of evil persons like Ravvan, Dhushyasana and Hiranyakashipu. Minnuku represents women character like Sita, Panchali and Mohini. Teppu is for the characters of messengers like Jatayu, Hamsa and Garuda. Kari is for hunters and forest people. Costume plays a very important role in Kathakali to understand the dance for the audience. There are three gunas known as sattva(goodness), rajas(passion) and tamas(darkness) which are portrayed in the dance and these characters are present in all the human beings. Along with this heavy make up the artists also use jewelleries to suit different characters. Instruments and music: Music sets a very vital role in Kathakali as it shows the emotions of the dancers and of the particular scene in the dance. If anger is shown by the dancer then the voice of the singer becomes loud and sharp where as when the voice of the singer is low and requesting then it means sad scene is being depicted. Various instruments are used in Kathakali some of them are Maddalam, Centa and Ityakka are three drums. The performers are mum while performing the dancers do not utter a word. They express only through mudras and hand gestures. The song is sung by the vocalist from behind. The singing is quite different in kathakali and it is called as sopaanam generally sung by two singers. Major musical patterns that are used are Chempata that is used to show different moods, Campa for tension, Pancari during sharpening of sword, triputa includes teachers or sages preachings, Atanta about kings or divine and Muri Atanta for comic scenes.